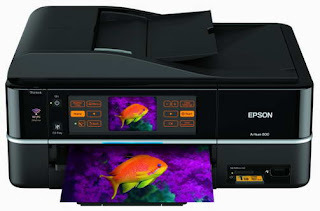 Epson has recently introduced a new line of all-in-one printers. The Epson Artisan 800 has almost every features that can be fitted into an all-in-one printer. The Epson Artisan 800 has WiFi fax, automatic document feeder, 7.8" smart touch panel, 3.5" LCD, and capable of printing ultra HI-Definition photos. If you have kids in your home, the Epson Artisan 800 has a feature that can make your kids busy: it can turn photos into personalized coloring book pages. The Epson Artisan 800 will be available this September and has an estimated retail price of $299.99.izes to match users’ printing needs.